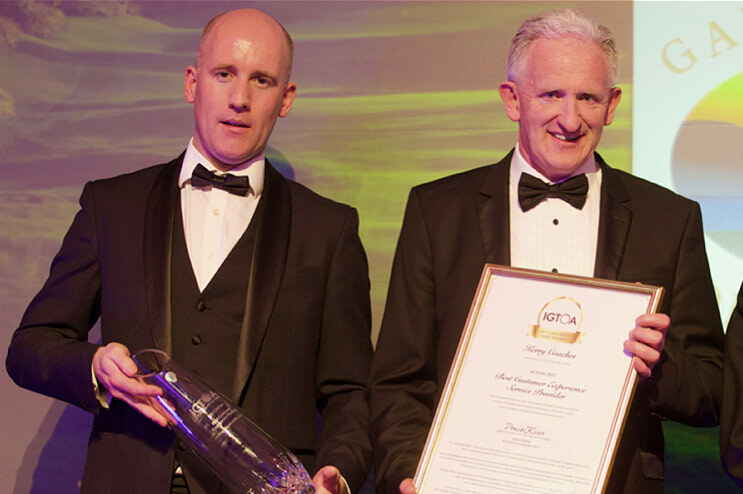 Legendary General Manager Noel Cronin of Waterville Golf Links was recognised for his outstanding contribution to golf at the 2017 Gala Irish Golf Awards presented by the IGTOA (Ireland Golf Tour Operator Association) on Monday 23rd October at The Trump International Golf Links and Hotel, Doonbeg. He received the Jerry Donworth trophy from Kyra Donworth of JD Golf Tours. Previous winners of this prestigious award include Pádraig Harrington, Pat Ruddy, Christy O’Connor Senior, Christy O’Connor Jnr and Mary McKenna. The Gala Black Tie event was hosted by Shane O’Donoghue the CEO of Niche Media and CNN’s Host of the International monthly golf programme, Living Golf. The official welcome to the event was made by Denis Kane, Chairman of the IGTOA and Niall O’Callaghan spoke about the importance of the overseas golfers to Shannon Airport and the West of Ireland region. Jim O’Brien received the 2017 Golf Manager of the Year Award for his work at Old Head Golf Links. The 2017 Links Golf Course of the Year went to County Louth Golf Club accepted by Liam Murphy, General Manager and Harry Collier, Captain. 2017 Parkland Golf Course of the Year went to Killarney Golf and Fishing Club with their General Manager Cormac Flannery and Head Greenkeeper, Enda Murphy accepting the award. 2017 Golf Resort of the Year went to Roe Park Resort, Limavaddy and accepted by Golf and Spa Manager Terry Kelly and Michael Marshall, General Manager. 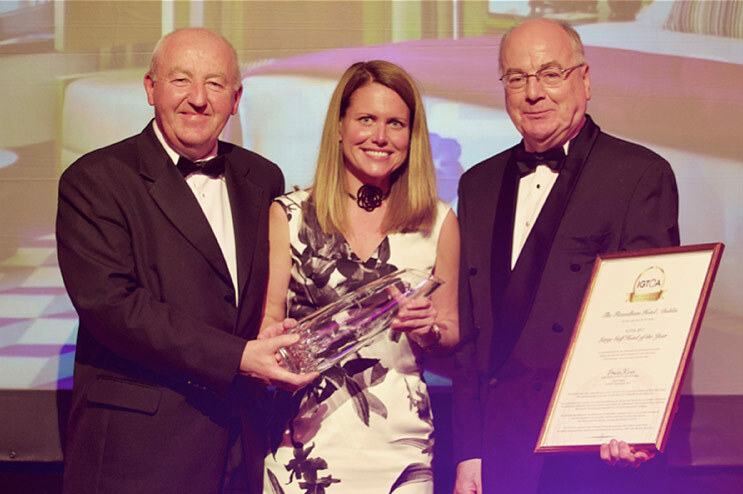 Director of Sales and Marketing Bronagh Kelleher of The Fitzwilliam Hotel, Dublin accepted the 2017 Large Golf Hotel of the Year Award. 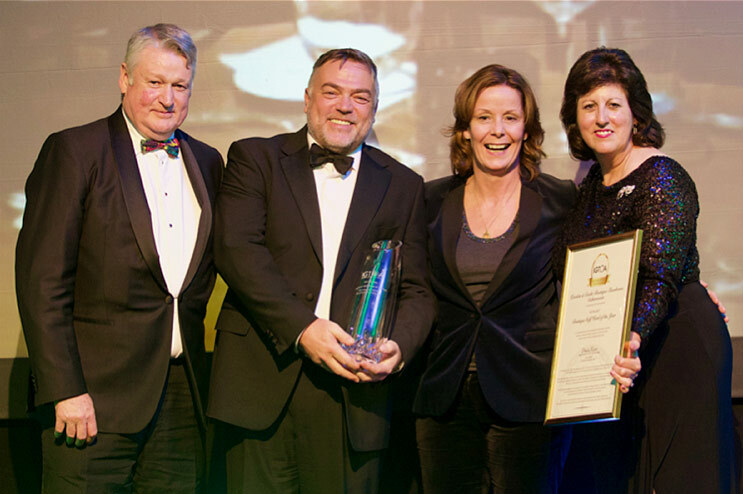 Andrew and Kate Cooke of Quinlan and Cooke Boutique Townhouse, Caherciveen in Co. Kerry accepted the award for the 2017 Boutique Golf Hotel of the Year. The IGTOA added three new awards for the Best Customer Experience in 2017 in three categories. The Bushmills Inn, Co. Antrim receiving the Best Customer Experience – Property and this was accepted by Nikki Picken, Sales and Marketing Manager of The Bushmills Inn Hotel and Restaurant. 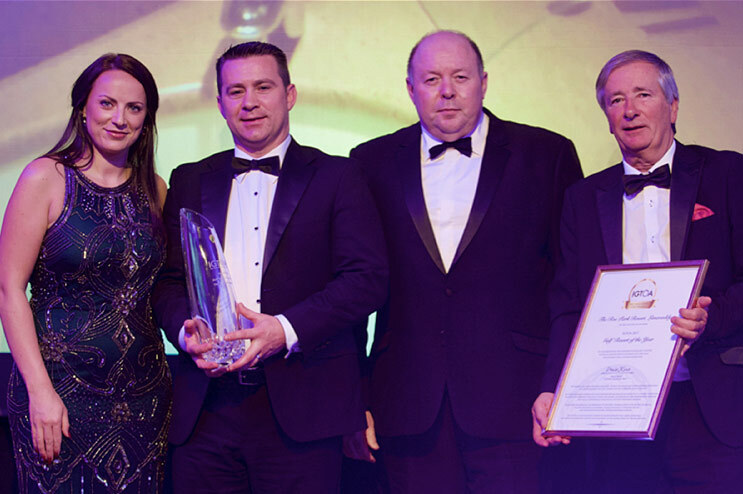 The Best Customer Experience – Service Provider was accepted by Mike Buckley, Managing Director of Kerry Coaches. 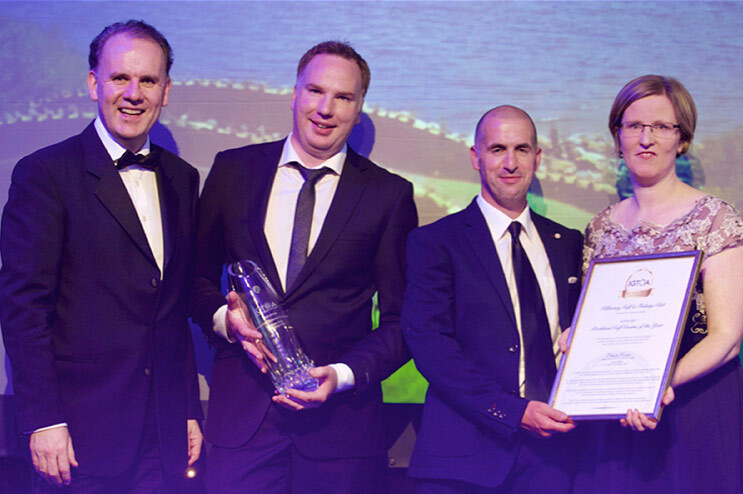 The Best Customer Experience – Golf Club went to the Galway Bay Golf Resort which was accepted by Barry Phelan, GM of Galway Bay Golf Resort. The Gala Irish Golf Awards are held annually as part of a two-day event with included the National Golf Tourism Conference on Sunday 22nd October and the 2017 IGTOA Golf Classic which took place on Monday 23rd October at one of Ireland’s premier links courses, The Trump International Golf Links, Doonbeg, Co. Clare. Regarded as one of the top golf resorts anywhere in the world and situated on over 400 acres of Ireland’s most spectacular links overlooking the majestic Atlantic Ocean. The IGTOA National Golf Tourism Conference & Gala Irish Golf Awards is the largest annual gathering of Irish Golf Tourism Industry professionals, who participate from all areas of the Irish Golf Tourism industry. Representatives from Ireland’s accommodation providers, golf courses and golf resorts, transportation providers, PGA Professionals, Golf Media and Golf Merchandising companies all gather for this national networking event. The event was supported by John Deere, Shannon Airport, The Trump International Golf Links and Hotel, Doonbeg as Title Sponsors and was attended by representatives from leading international golf and tourism organisations such as Fáilte Ireland, Tourism Ireland and Tourism NI. This event was also supported by the Hertz, Ping Apparel, Waterford Crystal, Golf Digest Ireland and Eno Wines. 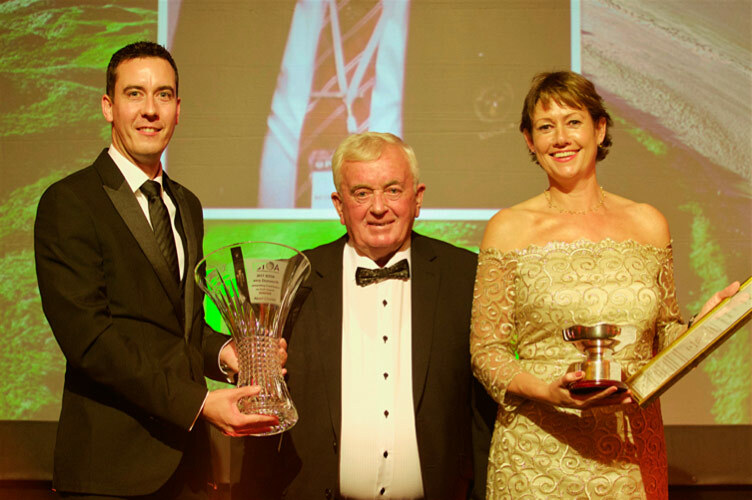 A selection of leading Irish companies in the golf tourism industry received accolades on the night with winners in the hotel, golf course and golf resort categories. The event is held each year by the Ireland Golf Tour Operator Association (IGTOA), an organisation that represents the National Irish Golf Tourism Industry and is pro-active in the promotion, growth and development of the Irish Golf Tourism domestically overseas. 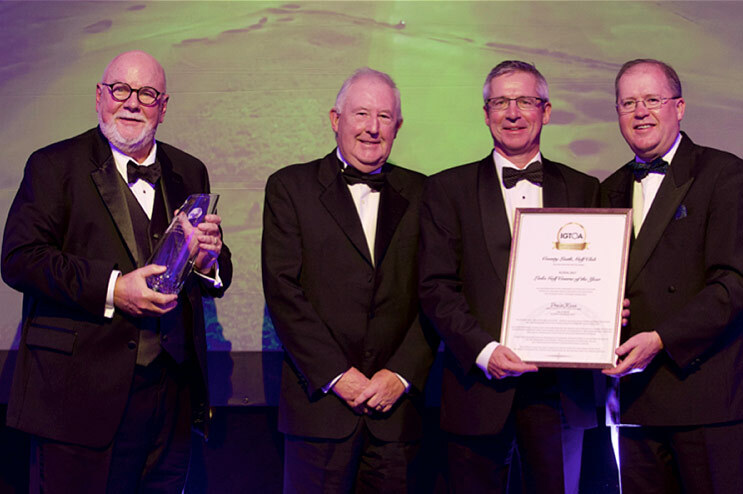 The 21st National Golf Tourism Conference and 2018 Gala Irish Golf Awards will take place at Galgorm Resort, Ballymena, County Antrim and The Royal Portrush Golf Club, Portrush, County Antrim on the 21st and 22nd October 2018. Main image: Kyra Donworth JD Golf (right), and Niall O’Callaghan Shannon Airport (left) present the IGTOA Jerry Donworth Outstanding Contribution to Golf Award to Noel Cronin of Waterville Golf Links. Accepted by GM Cormac Flannery and Head Greenkeeper Enda Murphy of Killarney Golf & Fishing Club (centre). Presented by IGTOA Member Catherine Murphy, Irish Pro Golf Tours and David McCoy, Waterford Crystal (on the left). Winner – Mr Jin O’Brien of Old Head Golf Links (centre). Presented by IGTOA Member Peter Keighery, Carr Golf and Noeleen Furlong, Hertz. Accepted by GM Liam Murphy and Harry Collier Club Captain COUNTY LOUTH GOLF CLUB (in the center). Presented by IGTOA Member Sam Baker, Haversham and Baker Golfing Expeditions (on the left) and Joe Russell, GM Trump International Golf Links and Hotel (on the right). 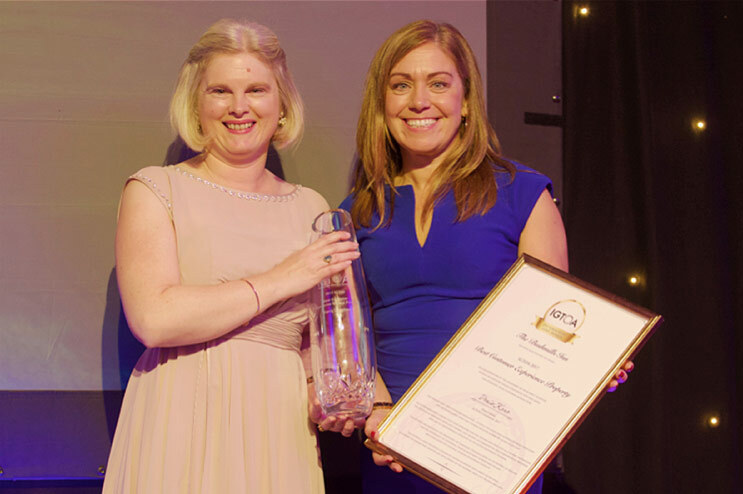 Accepted by Bronagh Kelleher, Director of Sales and Marketing, The Fitzwilliam Hotel, Dublin. 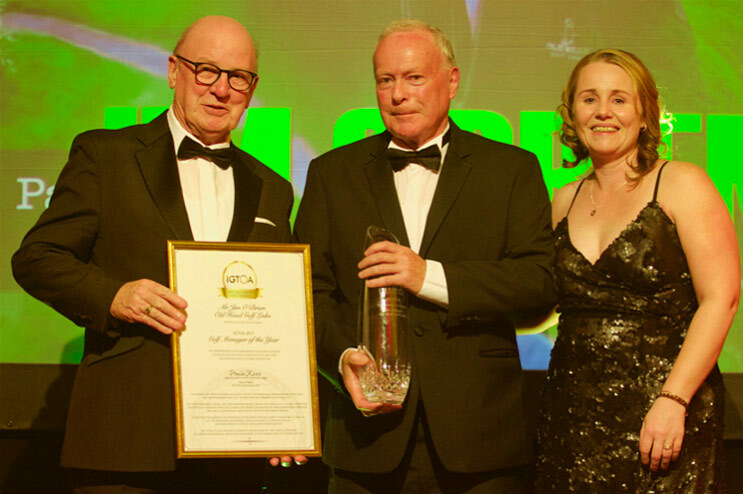 Presented by IGTOA Chairman Denis Kane and Donie O’Brien of ENO Wines (on the left). Accepted by Golf and Spa Manager Terry Kelly and GM Michael Marshall of The Roe Park Resort. Presented by IGTOA Member Pierce Wall, Ireland Golf (on the right) and Leanne Rice, Tourism Northern Ireland. Accepted by Andrew and Kate Cooke of Quinlan and Cooke Boutique Golf Hotel (centre). Presented by IGTOA Member Josephine Quinlan, Celtic Golf and Donal McEvoy, Ping Apparel. 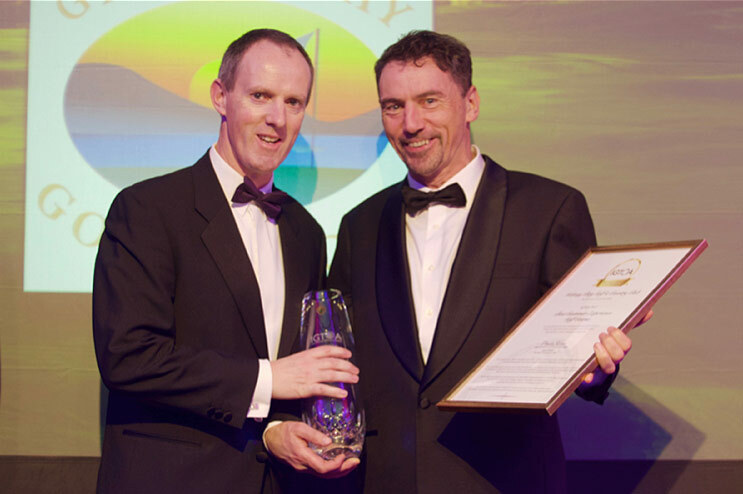 Presented by Paul Mockler, Fáilte Ireland (on the left) and accepted by Mike Buckley, Managing Director of Kerry Coaches. Presented by Brenda Johnston, Tourism Ireland (on the right) and accepted by Nikki Picken, Sales and Marketing Manager at The Bushmills Inn Hotel. Presented by IGTOA Member Eamonn Kennelly (on the right) accepted by Barry Phelan GM Galway Bay Golf & Country Club.